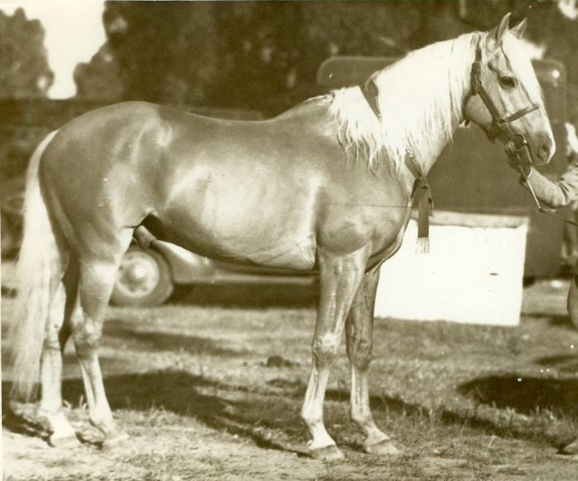 In 1948 a group of palomino enthusiasts met in Sydney at the Royal Showgrounds and from that meeting one of Australia's first breed societies - the Australian Palomino Horsebreeders Association, was formed. The head office was originally located in Sydney but was later moved to Melbourne where it remained until 1996. 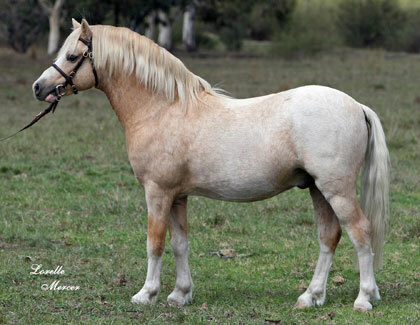 The first horses were quickly registered with the renowned palomino stallion Silver Sails (pictured), owned at the time by Ron Metherall, issued registration number S0001 in the studbook. 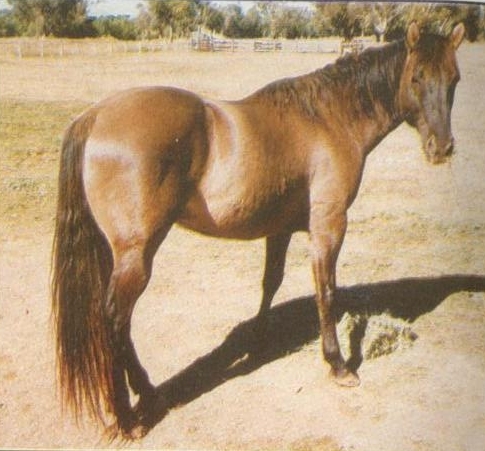 The first studbook mare registered was Colin Fitzpatrick's Golden Creamy, the first mare in the Foundation Mare Register was the black mare Ellimatta Princess owned by George Exell and the first gelding was Golden Nugget, another of Colin Fitzpatrick's horses. The original association had no branches; members dealt directly with the Federal Office for both memberships and registrations. Branches were formed in various States (except WA) between the late 50's and late 60's, with the Queensland branch being formed in 1969. For some reason a branch was not formed in WA at that time and as a result many WA members left the association in the early 1970's and formed the Western Australia Palomino Association (WAPA). A Western Australian Branch was later formed in the mid- 1980's. Several editions of Palomino News, a quarterly publication, were issued between March 1967 and April 1968 but was discontinued due to expense. The original palomino studbook, begun in 1948 with that meeting in Sydney, is owned and maintained by Dilutes Australia Ltd and is still in operation today with all palominos qualifying for studbook registration still being registered into it. This makes it the oldest palomino studbook in Australia with a continuous numbering system now over 50 years old. The first volume of the stud book was printed in 1974 and contained the pedigrees of 400 stallions, 595 mares, 127 foundation mares & 120 geldings registered to the 30th of September 1974 plus some 500 registered stud prefixes. Volume 2 followed in 1977 with an additional 1,669 pedigrees (293 stallions, 475 studbook mares, 203 geldings and 693 foundation mares) of horses registered between 1st October 1974 and 31st December 1977. There were also 1,465 new stud prefixes. Volume 3 was printed in 1981 and contained the pedigrees of a further 3,279 horses registered from the 1st of January 1978 to the 31st of July 1981 with another 1,681 stud prefixes (369 stallions, 889 studbook mares, 515 geldings and 1,502 foundation mares). The first 3 volumes of the studbook were printed as hard cover editions and were available for sale to members and the public. Volume 4, printed in 1989, was only released in an A4 loose leaf format and was not generally made available for public sale. It contained the pedigrees of the 258 stallions, 923 studbook mares, 1,646 geldings and 598 foundation mares (3,425 horses in total) registered between the 1st of August 1981 and the 28th of February 1989. Volume 5, although compiled, was never formally released. It was presented to the Federal Council in March 1994 and listed the pedigrees of horses registed between the 1st of March 1989 and the 28th of February 1994. There were 141 stallions, 441 studbook mares, 423 geldings and 214 foundation mares (1,219 horses in total). 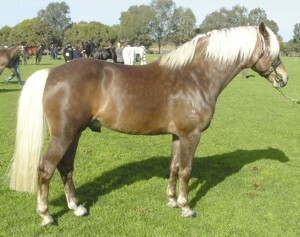 In 1991 an unresolved problem within the New South Wales Branch led to the formation of the New South Wales Palomino Society. In 1995 the New South Wales Branch itself broke away and was renamed the Australian Palomino Horse Association. These events forced the Federal Council to look at ways of guaranteeing a sustainable future for the association and in 1996, acting on legal advice, the Federal Council voted to wind up all its state based association's incorporations and become a company, run by a board of directors, with true legal status in all Australian states. The first step in that process was the renaming of the original association (Australian Palomino Horsebreeders Association) to Palominos Australia. At the same time the position of Registrar was moved from the Royal Agricultural Society of Victoria upon their resignation from the position and relocated to its current office in Perth. Later in 1996 the Victorian Branch broke away from the association, dropped 'Victorian Branch' from their name and began calling themselves the Australian Palomino Horsebreeders Association. This prompted a decision by the Federal Council to retain the original name as part of the 'new name' to ensure clarity of which was the original association and so the name became Palominos Australia/The Australian Palomino Horsebreeders Association. In 1998 Palominos Australia/The Australian Palomino Horsebreeders Association was duly registered as a not for profit company limited by guarantee. This step lifted the association out of the company of the state based incorporated associations (only recognised as legal entities within their state of incorporation) and elevated it to the same level as other nationally registered, company incorporated breed societies. In doing so it became the first, and to date only, truly national dilute register in Australia by virtue of its company incorporated status. The first Company President was Mrs Gail Rossington. On the 1st of June 1999 the company received a request that was to dramatically alter its destiny. That request came from the Australian White Horse Association, an association founded some 20 years earlier to register cremello and perlino horses and ponies and was a request for the company to take over the administration of their registers because the committee and members felt the time had come for double cream dilutes to take their rightful place in the world of dilutes alongside their single cream relatives. Their committee felt that the best way for this to happen was for a single cream dilute register to take them on board and actively promote them on the same level as their single cream dilutes and they'd chosen to approach PA / APHA Ltd because of its unique position as the only truly national palomino register. On July 23rd 1999 the board duly voted to take over their registers and in doing so set the first stone in the road to a new destiny. The register has retained the name 'the Australian White Horse Register' in recognition of its origins. Following this merger, the company began to receive numerous enquiries about buckskin registrations. At the March 2001 annual board meeting the idea of a separate dilute umbrella organisation, administered by a committee consisting of representatives from each of the member associations and catering for all the then acknowledged dilutions, was put to the board. The intention was to approach all the various buckskin and dun associations with a view to merging their operations to form such an organisation but included in the board's discussion was the proviso that should these associations prove unwilling to consider the idea the company would then look at starting up its own buckskin and dun registers. Negotiations with the various state based buckskin and dun associations commenced during 2001 and at the April 2002 annual board meeting the board was advised that the response from these associations had mostly been negative with the exception of the Buckskin and Dun Association of Queensland who had agreed to the merger and were in the process of winding up their incorporation in preparation for this. This process was completed during 2002 and the registers of the BDAQ were duly transferred across to the company. The board also resolved at the April 2002 meeting to open up its own national buckskin and dun registers, a process which was also completed during 2002. The decision was also made to create separate registers for buckskins and duns in recognition of the fact that they are completely unrelated dilutions and, following on from that, to offer separate sections for them on show programs at branch run shows. To date the company is still the only dilute register which does this. As a result of the amalgamation of the 3 cream dilutions and the duns the company name was obviously no longer appropriate and in 2003 was changed by member vote to the United Palomino White Buckskin and Dun Association Ltd (UPWBDA). Towards the end of 2006 a new dilution in paints and some of the Iberian breeds (Andalusian etc) was formally identified. The dilution, long assumed to be champagne, was scientifically located and identified as a mutation of cream in October 2006 and officially named Pearl shortly afterwards. This led to the introduction of a pearl register later that same year. 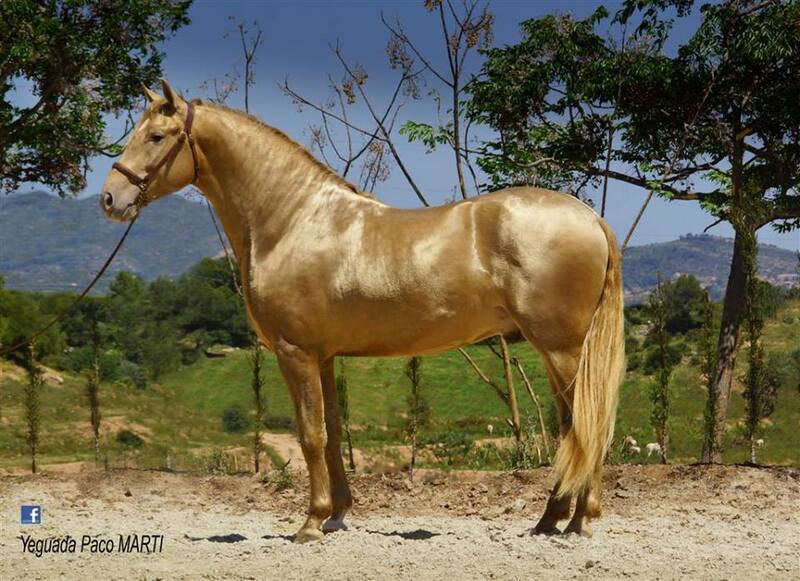 (Pictured - homozygous red pearl Sol PM II owned by Paco Marti, Spain). 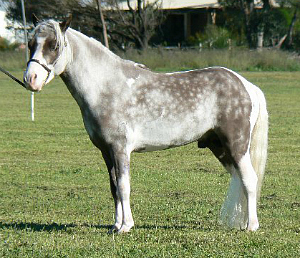 In 2008, with a full range of national registers available to cover all the currently identified equine dilution genes, the company officially changed its name to Dilutes Australia Ltd.
Again, in response to repeated requests, the Board in May 2008 introduced the Broken Coloured Dilute showing only register. In August 2013 this register was expanded to include dilute roans. In 2004 the company's distinctive logo was commissioned and trade marked. Since then it has become one of the company's most distinctive trademarks, which was the intention and purpose of the design. In 2009 the company celebrated the Diamond Anniversary of the founding of its palomino register in 1948. As part of the celebration, special crystal brow bands were awarded to winners of the Supreme Palomino Exhibit at each Branch Championships.